Go with cuddly cute promotional style with this mini bear keychain. They'll keep cuteness at their fingertips with this 3 1/2" key tag! It features a split ring attachment and is available in your choice of 8 popular shirt colors. Dress your bear up with your brand in vibrant full color process imprinting and create something that's ideal for a variety of events and occasions. 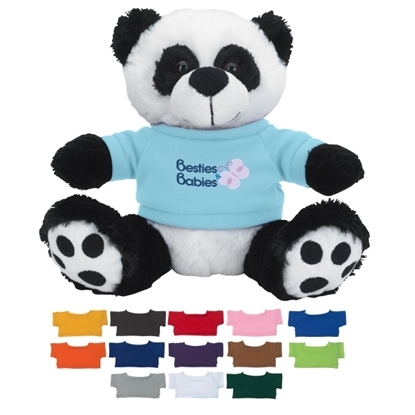 From preschools to zoos, this keychain offers snuggly promotional appeal. Snuggle up with this big paw panda! 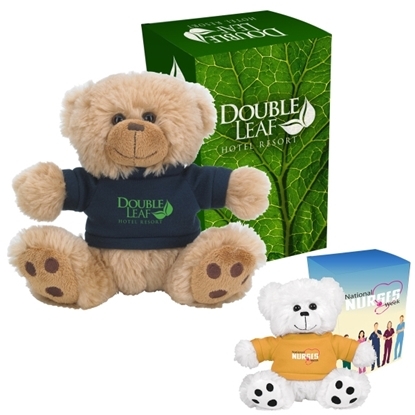 It's a stuffed animal that measures 8 1/2" and comes with a shirt that can feature your company name or message. Choose from fourteen popular colors to best represent your brand identity and imprint your logo with our heat transfer method. This is the perfect gift for children and makes for a good giveaway at a zoo or fair. Enhance your marketing strategy with a dash of cuteness today! 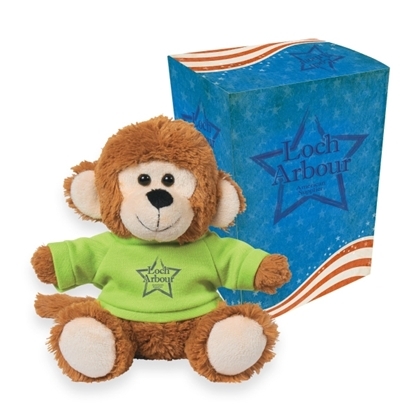 This 6" marvelous monkey will certainly add smiles to the faces of any recipient. It comes in a custom box and is dressed in a cute shirt (with your choice of 14 popular colors) that will showcase your company name, logo, or message thanks to our one color / one location imprinting method. The gift container will be imprinted using our 4-color process. This is great for Valentine's Day or Christmas, but kids will also love to add this to their collection. Clients will be excited about an offer like this! This 6" lovable lion is a way to make a great connection with new customers. It comes in a custom box and is dressed in a cute shirt (with your choice of 14 popular colors) that will showcase your company name, logo, or message thanks to our one color / one location imprinting method. The gift container will be imprinted using our 4-color process. This is great for Valentine's Day or Christmas, but kids will also love to add this to their collection. Roar like a champion when you make this part of your winning promotional strategy! 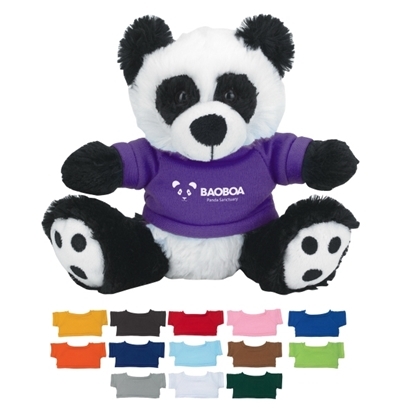 This 6" plush big paw panda is the perfect way to draw more customers to your business. It comes in a custom box and is dressed in a cute shirt (with your choice of 14 popular colors) that will showcase your company name, logo, or message thanks to our one color / one location imprinting method. The gift container will be imprinted using our 4-color process. This is great for Valentine's Day or Christmas, but kids will also love to add this to their collection. Give your clients something to be excited about! This 6" plush big paw bear is a great item to give in order entice new customers. It comes in a custom box and is dressed in a cute shirt (with your choice of 14 popular colors) that will showcase your company name, logo, or message thanks to our one color / one location imprinting method. The gift container will be imprinted using our 4-color process. This is great for Valentine's Day or Christmas, but kids will also love to add this to their collection. Make this your next great giveaway! Mypromotionalpens.com offers the largest and best priced selection in Promotional Stuffed Animals & Toys. We will price compete and we won't be under sold. Let our graphic designers make your personalized Stuffed Animals & Toys standout above the crowd at no charge. We won't stop until you are completely satisfied with your custom Stuffed Animals & Toys art proof.Use category search filters on your left to help narrow your search to find exactly what you are looking for.